A WREATH OF WHITE POPPIES was laid in the Garden of Remembrance in Dublin on Wednesday by veterans from the Irish, US and British armed forces to remember all those – soldiers and civilians – killed and injured in war. 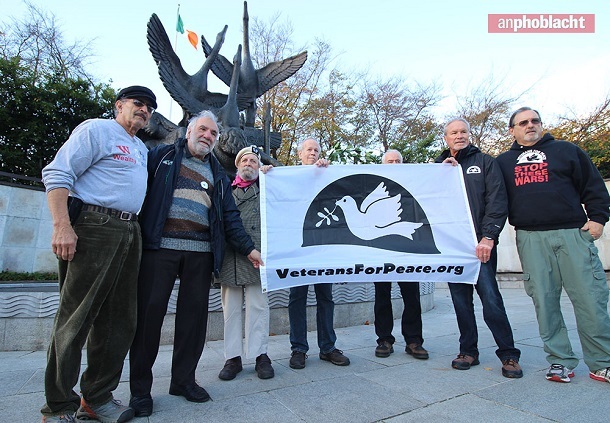 The 'White Poppy' event was organised by Veterans for Peace (Ireland), who hit out at the Irish Government for complicity in ongoing wars by allowing places such as Shannon to serve as "forward air bases to fuel wars in the Middle East". One of those taking part in the event was World War 2 veteran Norman Scarth, aged 90. On Christmas Day 1943, Norman was serving on HMS Matchless during the Battle of the North Cape and took part in the sinking of the feared German battleship Scharnhorst, an attack that left more than 1,800 German sailors dead. "Tragically, those men all died in vain, as did my own brave young shipmates. Everything we fought against is now in Britain," he said, condemning the failure of the British state to uphold human rights along with what he described as "endemic corruption" within the state itself. "The present chaos in the Middle East has been mainly caused by irresponsible and illegal wars waged under the false banner of humanitarian intervention, just as World War 1 was justified in Ireland as a war 'in defence of small nations'." "Those soldiers who died in WW1 were, for the most part, not heroes but victims who were conned by their leaders. Those who were shot at dawn due to post-traumatic stress (PTSD) were not cowards. They too were victims of war." 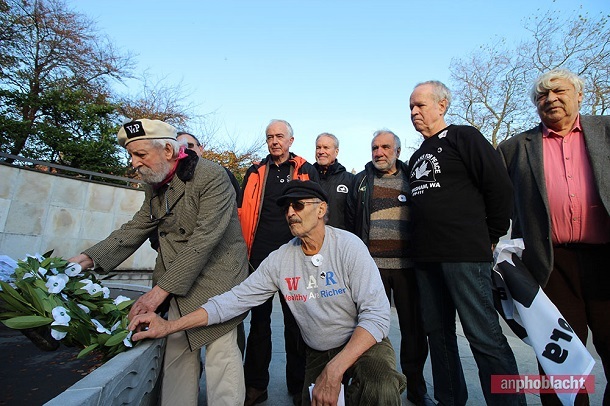 ◼︎ Veterans for Peace UK – made up of British armed forces former personnel, including those who have served in Ireland and the Middle East – staged their own 'White Poppy' commemoration at the Cenotaph in London on Remembrance Sunday.